It's widely known that Sonic and Knuckles (S&K) started out as the latter half of Sonic 3, but development constraints forced SEGA to split the game in two, putting S&K onto an innovative Lock-On cartridge that, when combined with Sonic 3, pieced the game back together into its original state. Now, with the announcement that Sonic the Hedgehog 4 is coming to WiiWare and will follow on from S&K's story, SEGA brings us the final piece of the Mega Drive collection. As the first game to concentrate on different stories for its two leads, Sonic & Knuckles could be seen as a branching point for the series, though its method of delivering story without dialogue was probably something that should have survived into the 'hog's later adventures. As a game in its own right it's competent platforming, but doesn't really get going until you reach the third or fourth Zone, though arguably the same could be said of its predecessor. Whenever Sonic & Knuckles appears on a console, the first question on everyone's lips is "does it feature Lock-On? ", so we'll happily move to confirm that here. Accessed through a menu at any time in-game, you can select from any of the three original Sonic titles you've already purchased and activate the Lock-On feature. 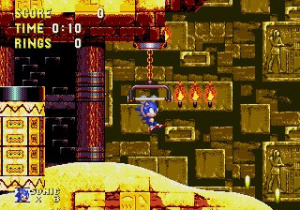 Sonic 1 and Knuckles lets you play a seemingly limitless number of the "get blue spheres" bonus stage; combining with Sonic 2 puts Knuckles into the Emerald Hill Zone and beyond, but Sonic 3 and Knuckles is the series' magnum opus. In fact, it's worth saying you haven't fully experienced either title if you haven't played them with Lock-On. 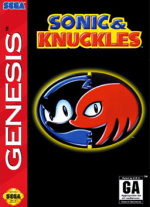 Joining both titles together creates what many deem to be the ultimate Sonic game, allowing Sonic, Tails and Knuckles to play through the entirety of both games, with different routes for each character based on their unique abilities. Although Tails is again relegated to a facsimile of Sonic's story, with no real path of his own, the red and blue chaps get very distinctive stories, though they play the same levels for the most part. Sonic & Knuckles's downfall is that it's very much a product of its development: if you've played through it with Sonic 3 locked-on, it never really feels complete without it. Although it is a full game in its own right, it's certainly recommended you grab this and Sonic 3 if you want to experience both titles to their fullest. Obviously that doubles the price to a rather rich 1600 Points, which may seem steep depending on your existing collection - Sonic Mega Collection for GameCube features seven 16-bit titles and is available reasonably cheaply now too. Plus, importantly for EU readers, the Mega Collection features 60Hz support, something understandably important to Sonic's speed-based gameplay that is sadly lacking from the Virtual Console. 800 Points gets you a decent Sonic platformer that only really begins to hit the heights halfway through, although having separate stories for each lead character extends the gameplay somewhat. Anyone who's played Sonic 3 to death should certainly consider grabbing this to extend the game significantly as it adds new areas and generally improves both titles hugely. As a standalone it's a decent buy, but if you've downloaded previous VC Sonic titles for Mega Drive then this is a true value-for-money purchase. My all-time favorite Sonic game, and nothing can touch the majesty of locking Sonic 3 onto this one. Pure Sonic bliss! Awesome. I'm so gonna buy this. Inquery: does the lock-on change the music in Ice Cap and the later batch of levels from the original to totally new scores? Because that is the case with the Sonic 3 & Knuckles game on my PC. And I really, really prefer the music of that one. The Micheal Jackson tunes just rub me the wrong way. Now I just need to get 800 points somewhere. Also, I just now noticed that the screenshots in the review are random! Nice touch. :@William90 Check www.cheatingdome.com that will give some extra games. I too have Sonic mega collection but it might take me some time to unlock sonic 3 and knuckles. Great review with a great game. I've also got the Sonic Mega Collection on Gamecube and I think it's great. If you can pick up a copy its superb value for money. One of the things i'm not keen on for the disc is the method of unlocking stuff, which I think is pretty unispired, just a case of keep going into the games loads of times. You don't even have to play the game each time, just load it from the Collection menu screen, exit and repeat until you unlock. However, the unlockables are excellent so it's worth it in the end. I don´t agree with this review. Well done for mentioning the downside fo the 50hz PAL VC version. Something that's too often overlooked in VC reviews of Megadrive games. Nice review Pros, good score. I love these games. If Classic Collection doesn't deliver, I'll be grabbing the 4 titles from VC. @Betagam7 - It gets overlooked purely because the norm is for PAL MD games to run at 50hz. James made a point of mentioning on this release because it seems that Sega has finally changed its stance on the matter - fingers crossed, anyway. Just to clarify: this title doesn't support 60Hz (I hate having to do the Z + A + 2 thing...) but the Mega Collection does. Let's hope SEGA gives us proper 60Hz conversions in future. As for the Ice Cap music, I haven't got that far yet but my understanding is this is 100% faithful to the MD original, so I should imagine the soundtrack is in. @Brainhost: You mean the original Sonic & Knuckles compilation for PC? Wow, that takes me back. It had an awesome screensaver that came with it. All the tracks in that game were slightly different as it used MIDI format for the music (as opposed to whatever format the Mega Drive uses), and a few were quite different (such as Icecap). This is the Mega Drive version, so it will have the Mega Drive tracks. @Prosody: On the whole 50/60Hz thing - were the originals in the UK 50 or 60Hz? If they were 50 back then, then I'll get these anyway, I'm used to them being that way. @Raylax - your standard PAL Mega Drive could only output at 50Hz, so in that way these are faithful conversions. However, considering SEGA themselves introduced 60Hz to the console world with Dreamcast (RIP), and these titles are available in 60Hz mode on compilations and other machines, it's a shame to see them here in their bordered glory. Ah, Sonic and Knuckles. It's a good game, it's just better when locked on to Sonic 3. By the way, are you guys planning to do separate reviews for each of the lock-on games? That would be pretty sweet. This game always seemed a lot harder than Sonic 1-3. @Brainhost The stages of [Sonic 3] in [Sonic3 & Knuckles] aren´t as good as the [Sonic & Knuckles] stages. [Sonic 3] is just average, but [Sonic & Knuckles] is great ! This review doesn't make justice to the game. I never much understood the sonic phenomenon. They all seemed like cheap titles that didn't involve much thinking to me, but then I didn't play much of these early ones where the hubub seems to be about. I'll have to get one sometime. Sonic 3 and Sonic and Knuckles as a whole probably deserves a 10. One of the greatest platformers of all time. One of my favorite Sonic games, I am sure glad it's out! Will be getting it soon! EDIT: What none of the screenshots in the review article features Knuckles the real star of the game! Great review for a great game. Sonic 3 & Knuckles for life! I already have Sonic Mega Collection and I'm not dying to play this game with a Classic Controller or Wii Remote, so I think I'll sit this one out. I wholly recommend this to fans who don't have SMC or SMC+ though if you don't get pissed off about losing all your beloved collected coins after one tiny collision with an enemy (or maybe just 90% if you're quick enough). Got it for 360 already. Great review, Prosody. It's fun to take control of Knuckles. Off-topic: Does it matter if I call you either James or Prosody? Cool. 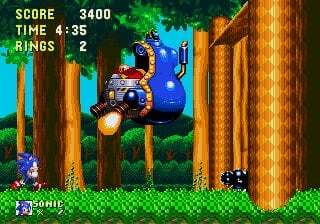 I'm getting into Sonic again after Black Knight (yes, I like Black Knight but not Unleashed. Sue me). I played mega collection again recently and made progress in the original. If Sonic 4 is any good, Sonic will be my favorite video game character again (Right now, Mario is my fav). A little off-topic, how do you get Sonic 3 & Knuckles in mega collection, and does it save like Sonic 3 by itself does? @Raylax Aaw, that makes me kinda sad, because those midi tracks were my heart and soul in my youth. I was really with my jaw on the floor (in a bad way) when I came to Carnaval Nights in the MegaDrive / VC version. The music was, in comparison and my humble opinion, soooo bad. And so was Launch Base; just a short, boring loop with some weird 'hey' voice-sample. Yeah Micheal... Ice Cap still had a certain charm though. this is THE quintessential sonic game, period ( as long as its locked in to sonic 3 of course). none of the others capture what this one does. Oh, I forgot: I always love the opening lines from these reviews. "Lock-on, baby"
@Prosody: Thanks, I'll check that out. Now, how about the saving, or will I have to use a level selector? It looks like the Sonic 3 & Knuckles combination on the Wii does not copy over your Sonic 3 data. This means if you previously bought Sonic 3 on the VC and completed the game with several characters you cannot resume those saved games when you play S3&K. S3&K seems to start with all the save files blank. 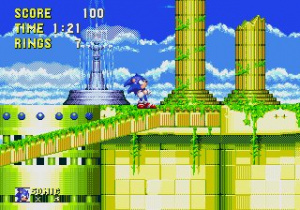 Correct me if I'm wrong, but I seem to remember the original S3&K cartridge on the genesis letting you resume from your Sonic 3 data. Of course I could've just forgotten over the years. I always kind of thought Sonic 3 seemed to be lacking something that the previous two had (I never had the chance to play Sonic and Knuckles or experience the lock-on aspect of Sonic 3). Maybe this is the missing link that Sonic 3 needs? I'm thinking of buying it tomorrow. Oh, never mind. I looked it up on wikipedia. It DOES have saves. @Ultronator: No, you're remembering correctly. Said that on 'kipedia as well. In what way has Sega changed its stance on the 60hz issue? I'm slightly confused as to that comment? "Sonic 1 and Knuckles lets you play a seemingly limitless number of the "get blue spheres" bonus stage"
Sonic 3 & Knuckles is serious contender for best platformer - and best game - of the 16 bit era. That's all you need to know. probably, actually:) Eventually anyway; I can put it off for awhile though. I love all of the Sonic games but I got them on the XBLA because... they are all kind of... way cheaper. Too bad the Sega Mega Drive Ultimate Collection doesn't have Sonic 3 & Knuckles (but it has Sonic 3 and Sonic & Knuckles ), so what's the best and cheapest way to play S3&K in 60hz? The cheapest and best way is on the Virtual Console. PSN doesn't have Sonic 3 or Sonic & Knuckles, and XBLA ports are shoddy as typical of Backbone. No save slots means no Super Sonic in normal levels early in the game, no multiplayer, and random frame drops and unresponisve controls moments. The DS collection also has some bad emulation issues. There are no collections that feature them as easily accessible, the Gamecube version has a dumb unlock system, and the Ultimate Genesis Collection has no lock-on whatsoever. The Virtual Console versions are the next best thing to slapping Sonic 3 on your Sonic & Knuckles cart in your old Genesis. the only ones without any issues. It might be a bit pricey, but it's well worth it for one of the best games ever made.